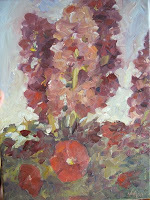 Hola~ Here is a painting of some flowers I did from life. I'm going to be working on more plein air/ direct observation pieces in the future, as its beneficial for all artists. To paint the seen not the "knowledge of". More to come!